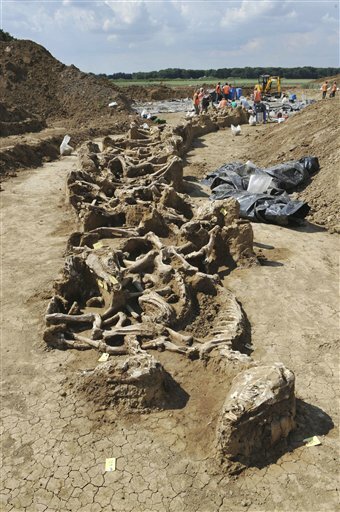 Archaeologists excavating a site in Borgharen, south-east Netherlands, before construction have found a 17th century mass grave of 51 horses. 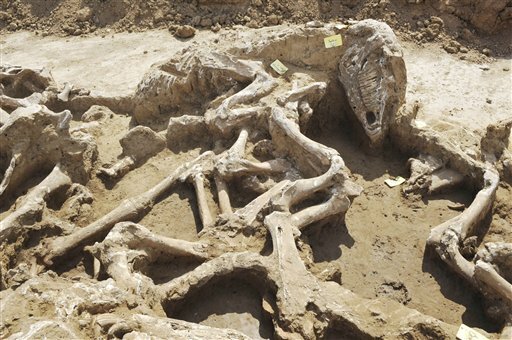 It’s the largest known horse burial ever found in Western Europe, although there may well have been larger pits that have been scattered by unwitting farmers tilling the land. The team was expecting to find prehistoric remains so the huge horse burial pit came as a surprise. The bodies showed signs of having been interred hastily; the skeletons overlap as if they’d been tossed in rather than carefully laid to rest. Radiocarbon dating on some of the bones date them to the 17th century, and if they were the remains of a cavalry charge gone bad, Netherlands in the 1600s offered plenty of opportunities for large war losses. If the horses were killed in a battle, likely candidates include a fight in 1632 during the Eighty Years’ War, when Dutch rebels quartered in Borgharen repelled a surprise charge by the Spanish cavalry. Another possibility is the 1673 siege of Maastricht by soldiers of French “Sun King” Louis XIV. That battle is considered a milestone in siege warfare, because of how the attacking French used zigzagging ditches to give their soldiers cover from the city’s battlements. Both engagements were fought during the summer. Dozens of dead horses rotting in the summer sun might well inspire burial prompt to the point of sloppiness. Also, there were no bridles or saddles found in the pit, just a few horse shoes and a single stirrup. The horses are all around 4 years old, and since their dimensions and bone structures indicate they were used for riding, not as draft horses, it seems likely they were cavalry horses who were stripped of gear before burial. One horse had a bullet hole in its skull right behind the eye socket, probably from having been put down after an injury.